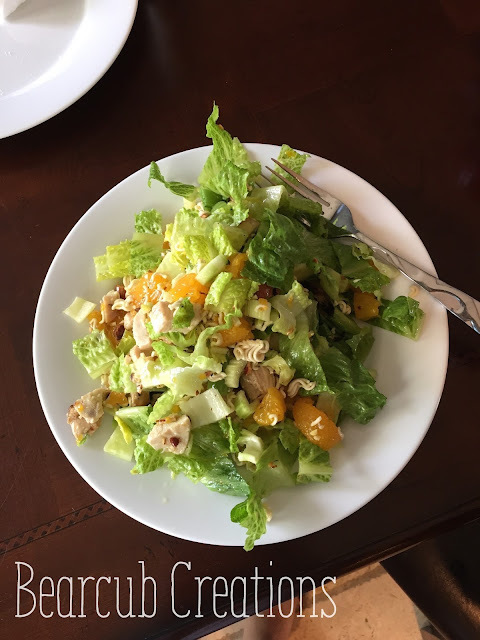 One of my favorite lunches is Chinese Chicken Salad. When I was little and as I grew up, my mom and I would go shopping and every time we would go get lunch at Nordstroms Cafe. We would always get their Chinese Chicken Salad and it was so yummy. Now when I make it at home, I think about those memories of having lunch with my mom. Myy recipe isn't like Nordstrom's but just one that we've created over time. It's quick and simple and so so good! -The ingredients for salad part are for a single large serving of salad. The dressing is for multiple salads, great for saving. -I put all the ingredients for dressing in a mason jar and shake to combine. Pour over salad and toss to coat all ingredients and enjoy!